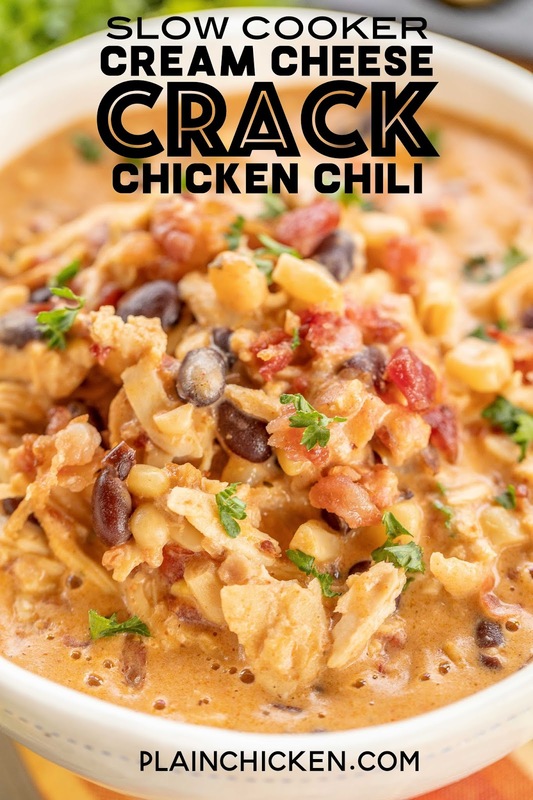 Slow Cooker Cream Cheese Crack Chicken Chili - this stuff is AMAZING! We've made it 3 times this month! We can't get enough of it!!! 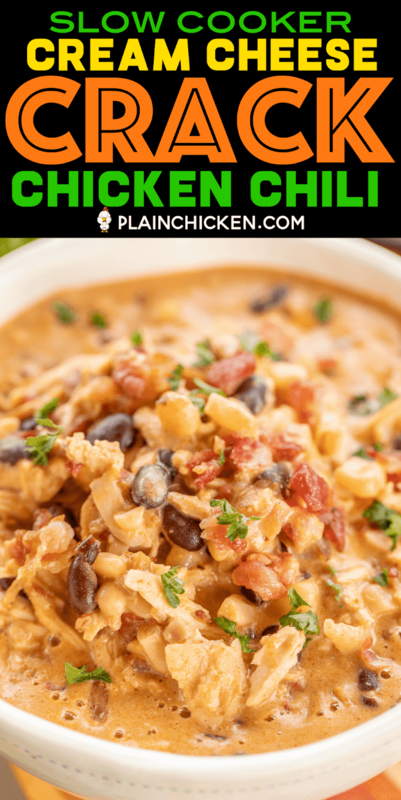 Chicken, corn, black beans, chicken broth, diced tomatoes and green chiles, cumin, chili powder, onion, ranch seasoning, bacon, and cheddar cheese. We served the chili with some cornbread and Fritos. PERFECT! This is already on the menu again this weekend! YUM! 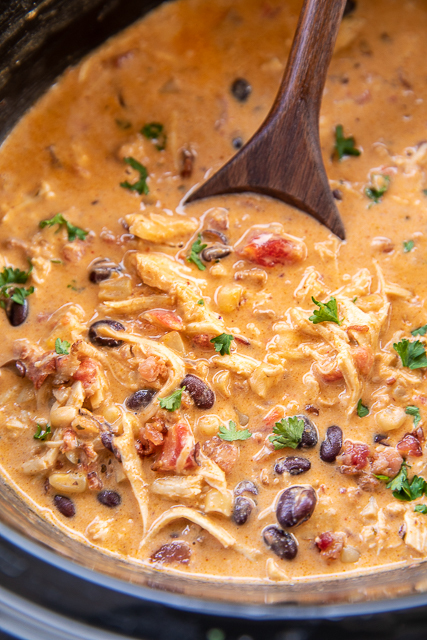 This Slow Cooker Cream Cheese Crack Chicken Chili has been on repeat in our house lately. It is SO good. It is also SOOO easy to make. Just dump everything in the slow cooker and close the lid. Literally takes about 5 minutes to prepare. I love easy dump meals like this one. 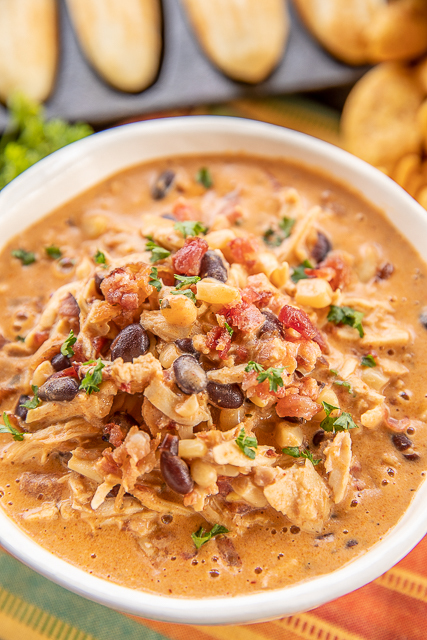 This Slow Cooker Cream Cheese Crack Chicken Chili is loaded with with chicken, corn, black beans, diced tomatoes and green chilies, cream cheese, cumin, chili powder, onion powder, chicken broth, cheddar, bacon and ranch. It is lick the bowl delicious. You can use turkey bacon and low-fat cream cheese to cut down on the calories. I don't suggest fat-free cream cheese. It just doesn't melt into the soup very well. 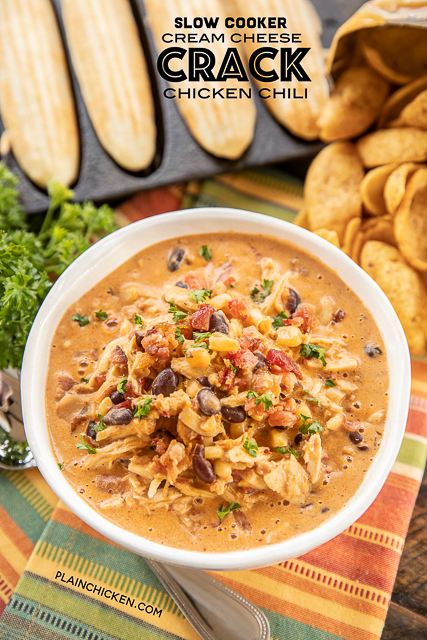 There is a little kick in this Slow Cooker Cream Cheese Crack Chicken Chili. If you are worried about the heat, make sure to buy a can of mild diced tomatoes and green chilies. 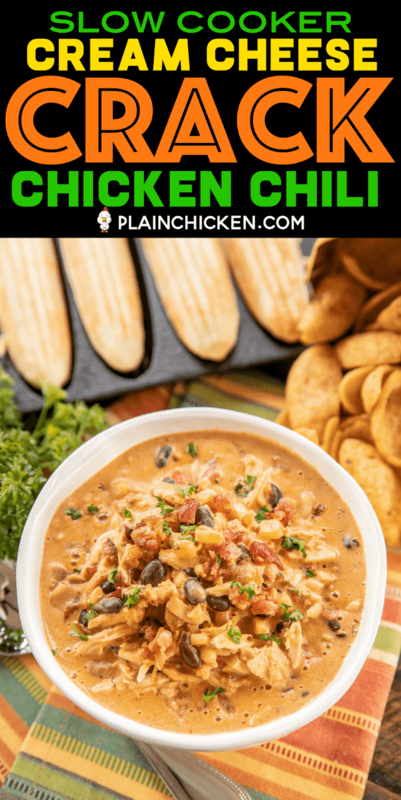 As I said, this Slow Cooker Cream Cheese Crack Chicken Chili is AMAZING! We served it with some cornbread sticks and Fritos. Perfect! It is also good leftover. 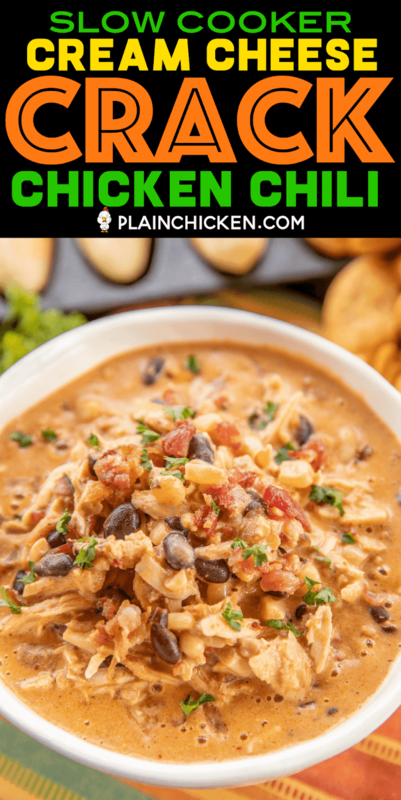 Give this a try if you are looking for a new chicken chili recipe. You won't regret it! 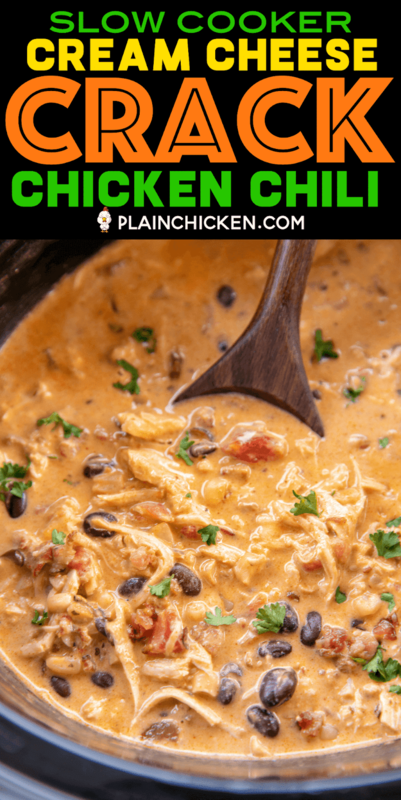 Place chicken at bottom of slow cooker. Add corn, black beans, diced tomatoes and green chilies, chicken broth, cumin, chili powder, onion powder ranch seasoning and bacon. Stir together. Place cream cheese on top of chicken. Remove chicken from slow cooker and shred with 2 forks. Return to slow cooker. Stir cheddar cheese into chili. Suggestions for making this in the Instant Pot? 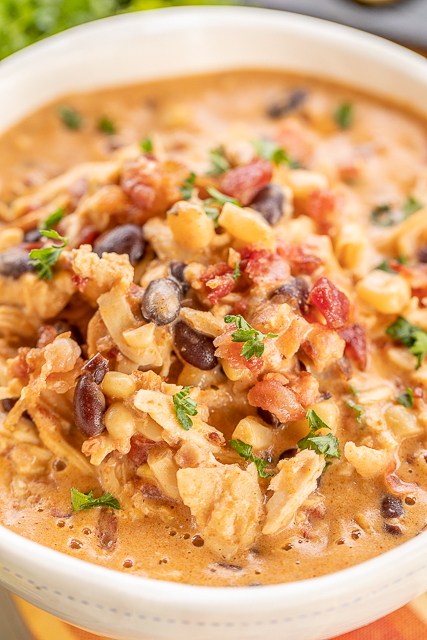 OOH, a new twist on your Cream Cheese Chicken Chili. We make that all the time and it's one of my kids favorite recipes! Do you put the cream cheese on top of everything? Or do you put it directly on top of the chicken? Thanks! It really doesn’t need to be very precise. Just on top of everything in the slow cooker should be fine. This was the first recipe that my boyfriend made that I actually liked enough for seconds. Well, thirds actually lol. It was very delicious last week and we're making it again today. Turns out he just eyeballed the spice amounts but it came out great last time so I can't complain. I think I'm gonna put him on slow cooker duty from now on and we'll make our way through your other slow cooker recipes. I made this on the stove top today and used ground chicken instead of chicken breast following the rest of the directions and it is delicious!! !